Click to enlarge. All images included. Dimensions: 2-1/4" w. x 1-1/4" h.
Some fellas like hanging out with the guys when they hunt. 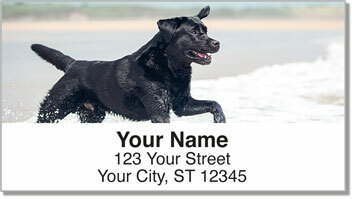 For me, the only company I need is my trusty Black Labrador Retriever. She's been with me for years, ever since she was just a clumsy puppy, and it's almost as if we can read each others' minds. When we're out hunting, we're both quiet, we're both watchful, we're both completely content. 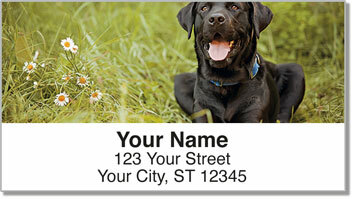 These address labels make a great choice for anyone who has a special relationship with their dog. 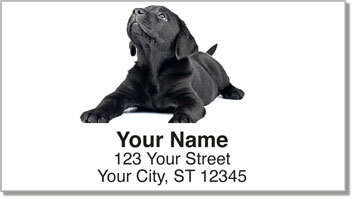 Stick them on your outgoing mail for a unique personal touch. Plus, the self-adhesive backing will make the chore of filling out envelopes quick and easy. 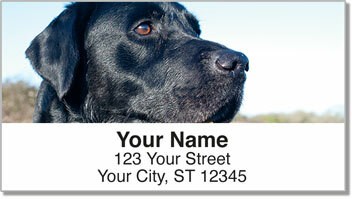 Get your own Black Lab Address Labels right now! Complete the order with some matching personal checks.